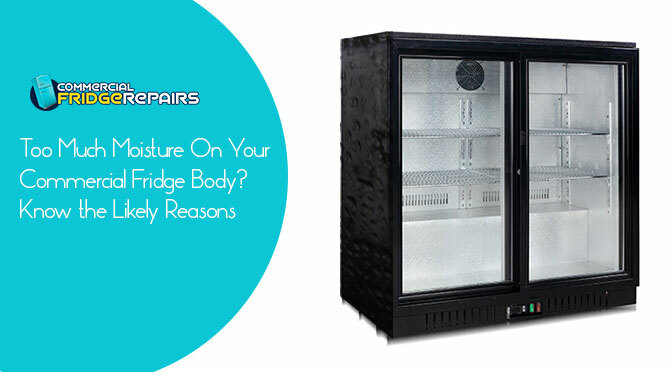 Is the exterior of your commercial fridge getting too much moist? This can very well be the early signs of baggage of issues you might have to deal with. Hence, it is high time you get in touch with a professional company that deals with problems of commercial refrigerators. What better name can you turn to than Commercial Fridge Repairs? Admittedly, we are home to some of the most experienced and potent technicians who will take care of the issue that you have in your hand. However, before our techies turn into action, knowing some of the likely causes of too much moisture on the exterior of your commercial fridge will always help. Some of the causes are elementary and non-technical. Hence, you can always check out to see whether you need a techie at all for this. In case you have not made any alterations to the temperature dials of your fridge, or if you have not kept hot stuff in the fridge, then it can only be the hot or too much humid conditions that is causing the issue. However, taking into consideration where you stay, use of AC can cause condensation on the surface. This also happens if it has been raining for long. There is nothing to be alarmed, and it’s likely that you won’t need repair of the commercial refrigeration by any professional. This is a very common cause that will understandably need no technician intervention. At times the fridge door is left open slightly for a few hours before being noticed. Keeping the door open even for 20 minutes or so will cause condensation on the surface. Again, as it is understandable, you won’t have to book any service call for this. This is a serious problem that should hoist red flags. If the gasket of the door is worn out and is falling off, it will inevitably cause condensation. You need to check the gasket to see what it is causing the problem. Check out the gasket to find if there is blackening caused by mould. You can try what is called the MONEY TEST. Close the door with a currency note in between the fridge and the gasket. If you can draw back the note without any effort even when the door is closed, that means the door gasket has gone for a toss, and it’s time to replace it immediately. Get in touch with our techies at Commercial Fridge Repairs for some immediate repairs. In case your refrigerator has the self-defrost option at times the defrost drain line may be filled up with ice. This will turn the fridge off and let the device defrost manually, resulting in the formation of moisture on the outer surface. Now the drain hose also gets blocked by ice or other objects. Again, this is a pretty serious issue, which may demand booking service calls for our technicians who will do all the commercial refrigeration repairs in Sydney. Get to our website and get in touch with us to let us know about your problem. We will respond at the earliest!